Life, liberty, and the pursuit of happiness- ideals that paved the way to the “American Dream.” This freedom to attain prosperity, once gained through just the right amount of sweat and determination, has now evolved to a sense of entitlement which cannot be maintained without plenty of debt. 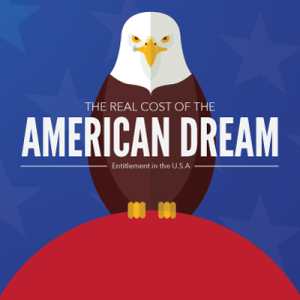 Why are Americans not achieving the dream? Make good work ethic a priority. Be frugal- even when you don’t have to be. Make saving the rule- not just an option. Don’t fall into the debt trap! Realistic expectations keep the dream alive and the dreamer happier!